If you are using commercially cast bullets you will find that they are cast really hard. What is happening is that there is not enough pressure in your loads to "upset" the bullet into the rifling. As a result you get gas blowing through the gap which erodes metal off the bullet which then is deposited on the inside of the barrel, which is what you found. Subsequent bullets just run over the lead and make little engagement with the rifling. Starting with a clean barrel and chamber throats load shoot some ammo loaded near the top end or, better yet, buy a box of factory ammo and see what that does. If it shoots factory ammo ok you know its not the pistol. This problem is made worse if the chamber throats, the bit between the front of the chamber and front of the cylinder, is smaller than the groove diameter of the barrel. You can check this by slugging barrel and chamber throats, there are plenty of tutorials on how to do this on-line. 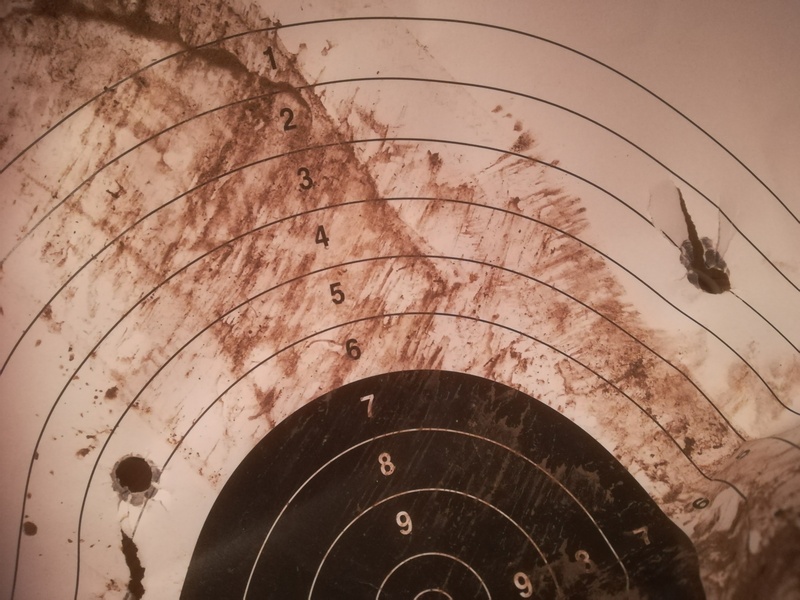 many thanks mate , i am using very little crimp ....here is one of the first targets at 25yards 5.5gr slight yaw but looks like rifling marks? Last edited by steve R; 07-03-2019 at 09:00 PM. Looking at the Lovex load data for D032, 9.7gr is the starting point, and the max load is 10.3gr. A load of 9gr should be stable, esp. through the 12" barrel, which will increase velocity over a 150mm barrel used for the load data. However, the bullet type is given as "SP", which is almost certainly a jacketed bullet, with a Soft Point. Jacketed rounds normally require one or more grains of powder than lead bullets to achieve the same velocity. So we have a situation where the published load data may not be that useful to you. However, you know the gun is OK, since you fired the 50 rounds of .44 Special ammunition, and they worked fine. 1. 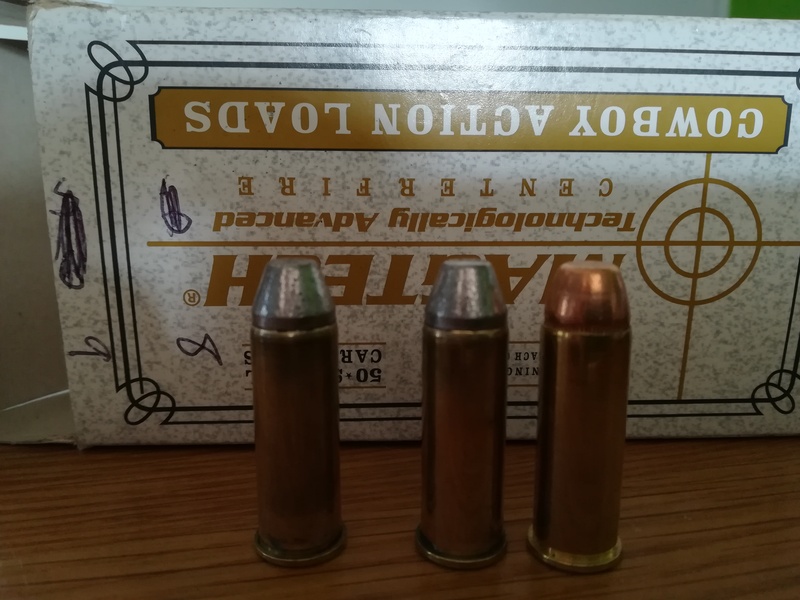 Make sure your .44Mag cartridge length is correct. 40mm (1.6") is where you wish to be; do not have the cartridges longer or shorter; strange things happen to pressure levels if you do. 2. Ensure your 240gr lead bullets are .429 in in diameter, or perhaps a little more (0.430). Shooting bullets sized less than this will not work well, since the bullet won't engage with the rifling properly. 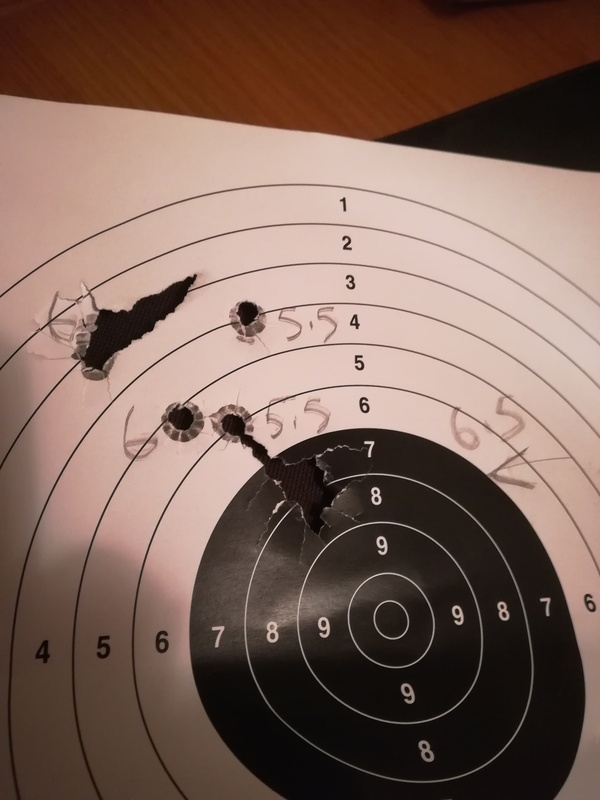 I've tried shooting .427 lead bullets in the past, intended for .44-40 calibre, and the results were awful -- tumbling, etc. 3. If the felt recoil of the loads you have tried so far was not uncomfortable, try a load of 10.0gr. Only make up a few (max. 5). See how they shoot. If none of the above works, I'd recommend a different powder. The Lovex guide suggests that D032 is not really optimum for .44Mag anyway. Given that your local range has velocity/energy limits you don't want to exceed, you are after a powder which is suitable for light target loads. I'm a big fan of Vihtavuori powders, and I've used N320 quite a bit in the past for such. I'd suggest a starting load around 5gr of N320. There will be many other fast/medium pistol powders which will be suitable, and I'm sure others will offer advice on these. Finally, I do recommend the use of a chronograph for load development. If you have velocity info, it is so much easier to diagnose what is going on. For example, if the loads you have tried result in velocities below 500fps, tumbling will occur. If, on the other hand, your velocities are 1000fps or more, then you are verging on breaking your range safety limits. Last edited by dprees; 07-03-2019 at 09:00 PM. dprees ,many thanks ,ill get some n320 saturday ,what do think on more crimp ,im using very little? Crimp might help a little, but it is really only needed for full-power (magnum) loads. I do crimp my target loads, with a light crimp, but really to ensure feeding through my Marlin underlever -- no requirement to do so to ensure accuracy. Try it, with another 5 rounds of otherwise identical ammo, and see if it makes a difference. Looking at your target picture which is now up on the site, I'm pretty confident that your problem lies with the powder. The black marks on the card, showing the rifling marks, are a very good indicator of low velocities, as is the tumbling. But given the amount of powder you are putting into the cases, it is very strange that your velocity should be so low. I've seen such behaviour before with low loads of slow pistol powders normally intended for full magnum loads; they deliver terrible accuracy, and often signs of tumbling too. But from what I can see, D032 is not such a powder. Before buying a tub of N320, is there anyone in your club you can scrounge some fast pistol powder from? Given that a tub of powder is close to £50, you might want to be cautious about ending up with two tubs of powder rather than one, in the unlikely event the gun is at fault. Then again, N320 is a very useful powder, so you can always sell it on, and from what I can see, your D032 is quite likely to be the issue. One other thought -- are you sure your powder scale (or other measurement device) is accurate? A reference weight is a 5p coin, which weighs 3.25grams, or 50.05 grains -- the best check weight is in your pocket...pick a new one! Get one of these for removing the lead. They are really useful. It fits a standard cleaning rod. so hopefully heres a pic of my loads ,it looks like ive got a bit more crimp than the factory copper round, does the crimp look too much? Your crimp looks fine, based on the slightly fuzzy photo -- without macro capability, it is difficult to get really close. Good luck with the Unique loads, and let us know how you get on. so 5.5 it is , all the info from the states is for much shorter barrels than my 12"......so would it be ok to try 5.0gr ,has anyone gone this low? By all means try 5.0gr of Unique, or even lower by a grain. See what the accuracy is like. As you drop below reasonable velocities, the groups get very spread out, so you'll know when you've dropped too far. A velocity of 600-650fps is fine for out to 50m; no need for more, as long as it accurate enough for your needs. I've developed loads around 600fps for use in my Marlin, which give 3.9cm (edge to edge) 10 shot groups @25m. That's X-ring accuracy. If you can scrounge the use of a chronograph sometime, you can establish precisely where your load lies on the velocity spectrum. Ask your club if they have one -- they really should if they have velocity/energy limits they want their shooters to adher to.